Operation Release the Tart! – Wait…are those…cookies?! 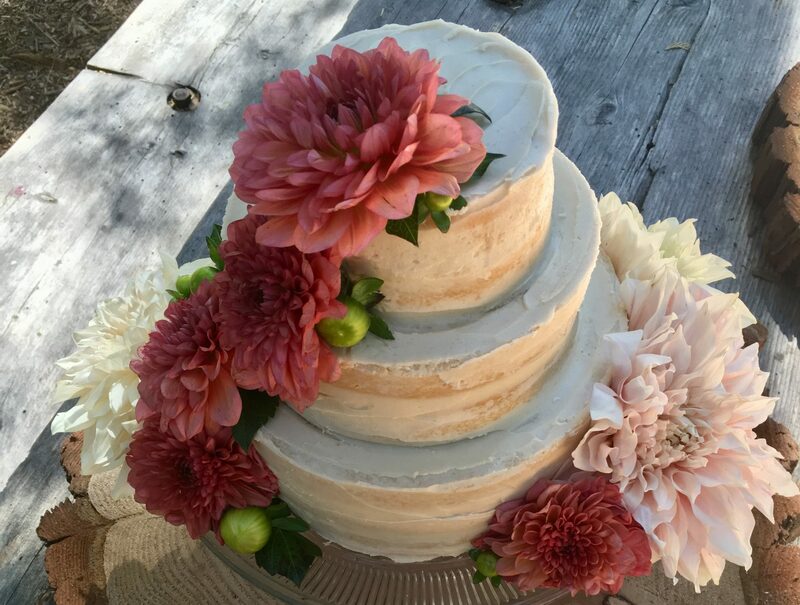 I’ve come to the conclusion (through careful analysis and methodological research) that I spend far more time baking, cooking, and planing what I’m going to bake and cook than I do actually studying. Oops. Whatever, I did well on my finals, so there! Besides, at least I know where my priorities are… food. And prohibitively (or not…apparently this isn’t stopping me) expensive active wear. As a close friend pointed out, I have been known to drop semi-ridiculous amounts on a pair of yoga pants, but there is no way on this earth that I would ever spend that same amount on a pair of jeans. Ha. Like I said, I have my priorities. Anyway. To illustrate this ridiculousness (no, not the yoga pants…anyone who sees me on a regular basis is fully aware that they comprise a good 75% of my wardrobe), I’ll give you the example of *the * tart. 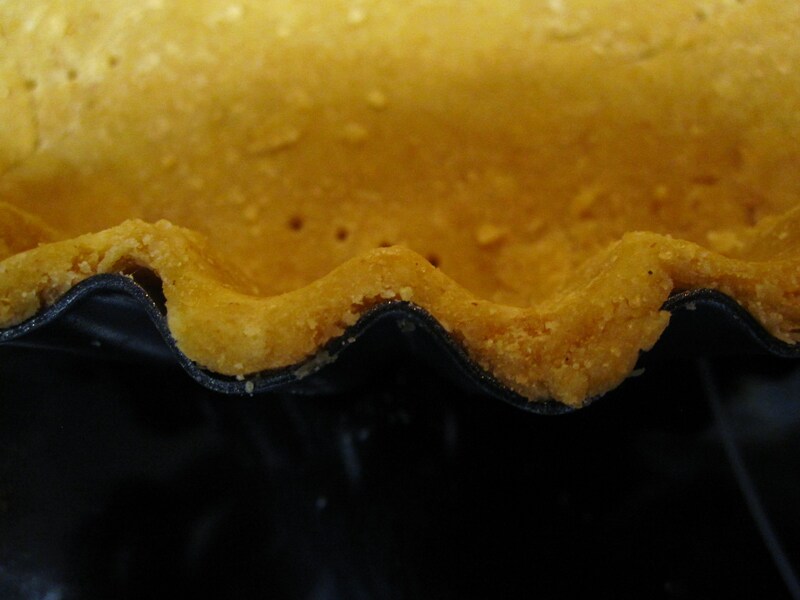 I’ve been eyeing my tart pan with a removable bottom (a genius invention, might I add) for about three months. And thinking about it, likely when I should have been paying attention to some theory or other. 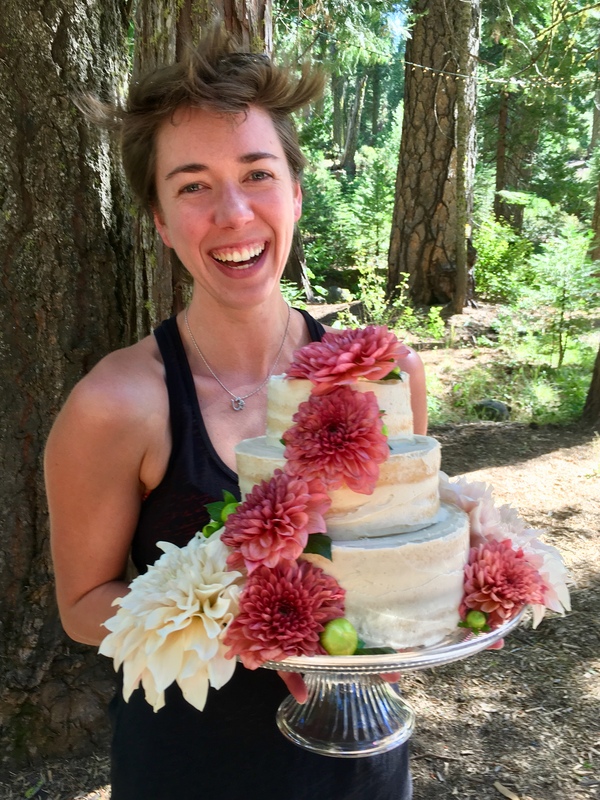 Thusly: Kira and I stumbled upon a tart in my La Boulange cookbook, that combined several of our favorite ingredients, and which looked like it could fly us to gastronomical heaven in about one bite. So. On Sunday, when we went grocery shopping, we bought the necessaries… goat cheese… creme fraiche… mushrooms… and BUTTER. (and hilariously ran into my painting professor, who then subsequently remembered that I bought creme fraiche, and asked me if I was eating my way through the store. Duh. What on earth would I be doing instead?!) I have spent ALL WEEK up until today greedily awaiting the tart to be, to the point of pretending it was Thursday (aka Tart-Day), so I could make it earlier. But… I waited! Aren’t you proud? I satisfied myself with making the dough yesterday, so I could pretend to do something useful and productive besides studying. I did this after going to happy hour at the Wild Pear for a Peartini… And then I made dinner. And then I was tired, so I went to bed. Hmm. Being a senior is mildly exhausting. Teehee. ANYWAYYY. I digress. Today was THURSDAY! TART DAY! The day I’ve been waiting for alllllll week, since my finals/semester is donezies (wheee! ), and I got to make and eat this fab tart. And it was fab, believe me… Kira can attest, since after we ate it, we had to do some serious lying on the floor working on digesting. It was that good. I mean, I know it sounds a little sketchy, but just trust me. Such a gastronomical tasty win. Even better: We have TWO tupperwares of leftovers. Hellooooo, cold tart. Mmmm, you are going to be so delicious when I eat you. For every meal. Until you’re gone. At which point I will be terribly sad but probably also day-dreaming about the next gastronomical adventure. I’m just fickle like that. From The American Boulangerie Cookbook. Makes… one tart, in an 11″ tart pan (or you could make smaller ones). I found it easier to make the dough the night before, and then roll it out and put in the pan, so that it was ready to fill the night we wanted to eat it. Makes the dinner a little simpler. In the bowl of a standmixer (hello Kitchenaide I LOVE YOU!) fitted with the paddle attachment, combine flour and salt. Add cold butter and mix on low speed, until the mixture looks like breadcrumbs (1-1.5 minutes). Add egg, cold water, and lemon juice, and mix until large lumps form. Turn out onto a lightly floured surface, and knead with the heel of your hand until the dough holds together. Shape it into a disc, and wrap it in plastic wrap (I stuck in a plastic bag). Refrigerate for at least and hour or overnight. I did mine for an hour and then rolled it out. On lightly floured work surface, roll out chilled dough (this is probably sacrilegious to the baking gods, but I zapped mine in the microwave next to a bowl of water for 15 seconds, to get it a little less dry to roll out. It seemed to work, and didn’t compromise the flakiness of the dough later). 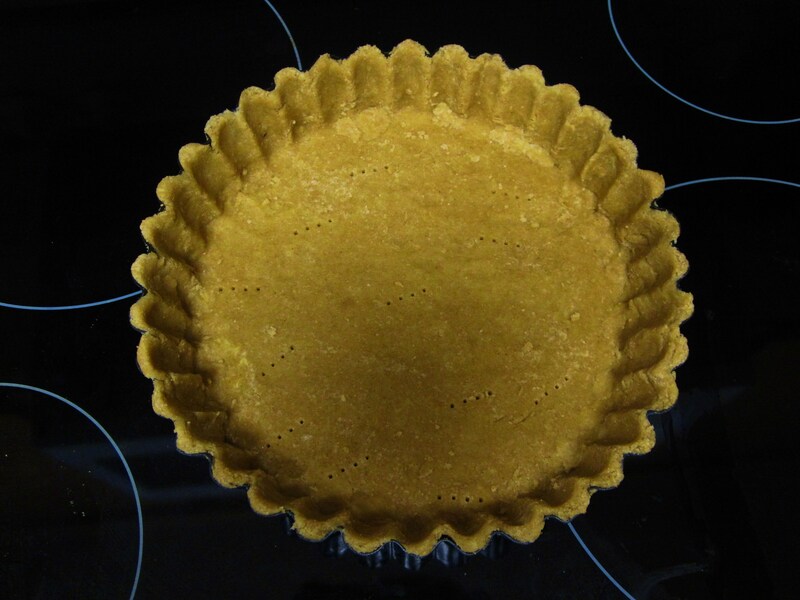 Try to roll it out to about 1/8″ thickness, and carefully transfer to the tart pan. Remove excess, and prick the bottom with a fork. Cover with foil or plastic, and refrigerate for an hour or overnight (mine was overnight). 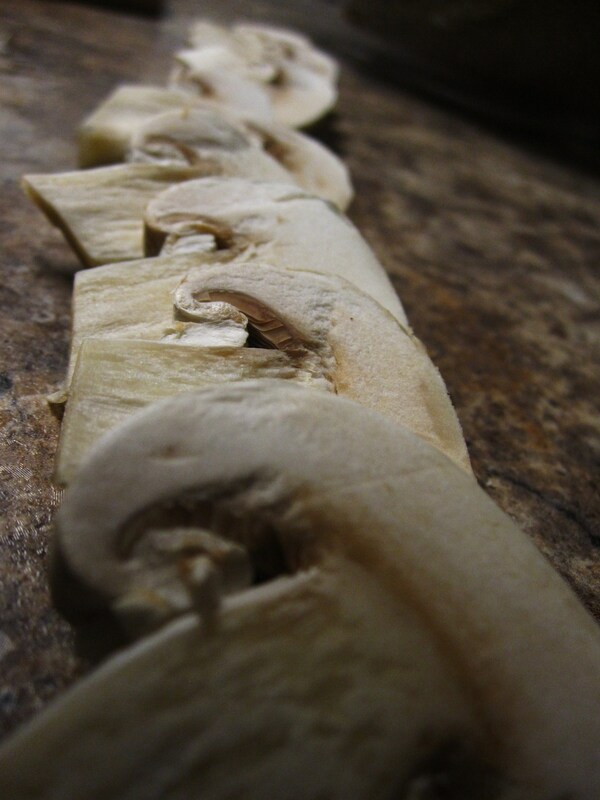 Slice the mushrooms, reserving the 12 prettiest slices for a garnish. In a large saute pan, melt butter and olive oil over medium-high heat. Saute mushrooms until they render their juices, and then until most of the juice is absorbed. Ours had a bit too much juice, so we drained them prior to use. Season with salt and pepper and let cool. Preheat the oven to 425. 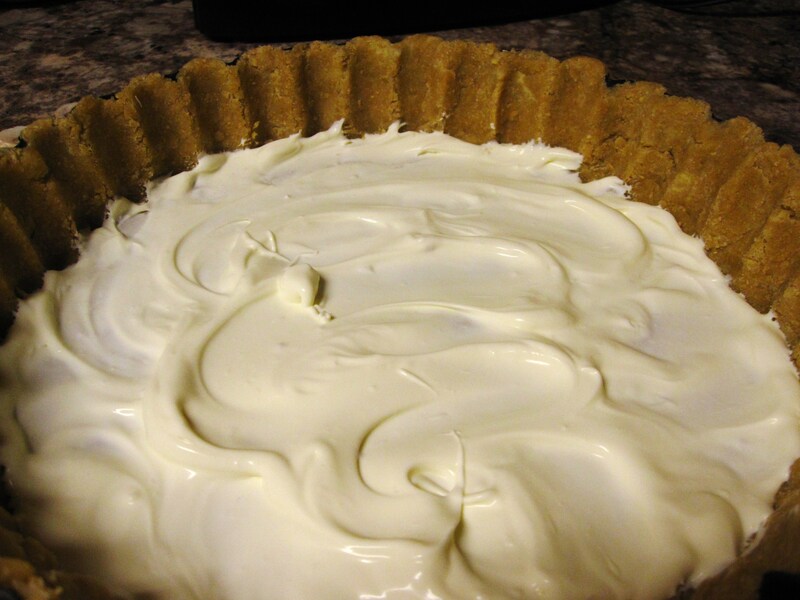 Spread 1/2 c of creme fraiche into the bottom of the chilled tart shell. Top it with sauteed mushrooms, and then with the goat cheese rounds. 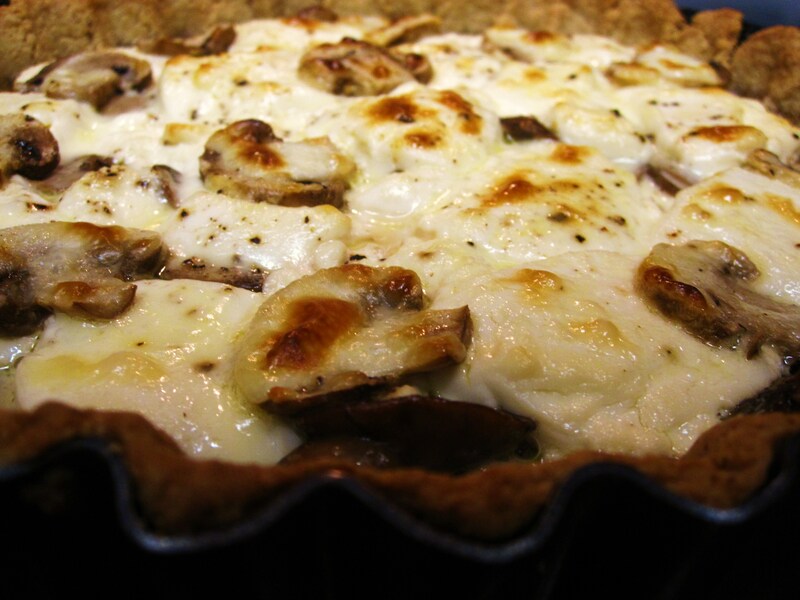 Garnish with the reserved mushroom slices, and then dollop (what a great word) the tart with the remaining 1/4 c of creme fraiche. Bake immediately until the crust is golden and the filling is bubbling, 25-30 minutes (ours was more like 30). Let cool in the pan, on a wire rack (do not attempt to release the tart while it’s still hot… it’s a bit difficult, and may require 2 people…) (whatever. we were hungry). Serve with salad and bread, mmmmm. I am DEFINITELY making this again. As soon as I get my hands on more goat cheese. it kind of looks like pizza. believe me, it's not. I like the documentation for Operation Tart. I am certain that I’ll like the real thing even more!